Each December, VFM staff round up our top picks from the Winter Markets to help make your local holiday gift giving and entertaining a breeze. 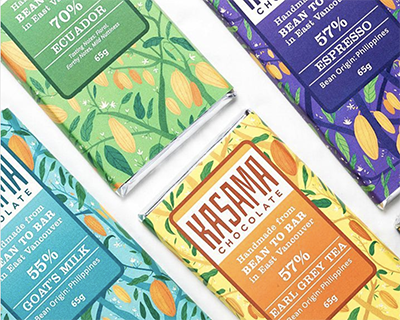 Kasama Chocolate will be at Nat Bailey on December 16. Also look for: buttery English Toffee from Blackberry Hill. Sons of Vancouver will be at Hastings Park on December 10. Also look for: a bottle of the newly released Salal Gin from Odd Society Spirits. 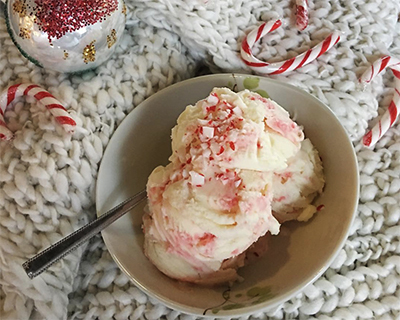 Also look for: handmade ice cream in flavours like Caramel Ribbons and Costa Rican Vanilla from Take a Fancy Sweets & Chocolate. BCB Honey will be at Hastings Park on December 10. Also look for: A jar of the Vancouver Special Honey from Six Legs Good Apiary, produced from their urban hives. 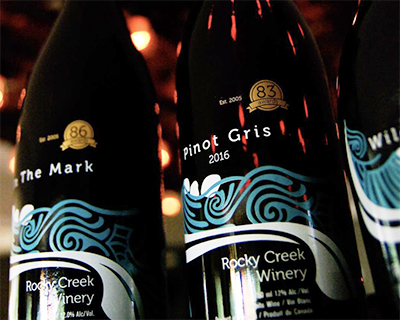 The folks from Rocky Creek Winery in Cowichan Valley, BC produce a great line of red and white wines along with special selections like sparkling, and rosé. Their Wild Blackberry has become their signature, great on it’s own as a rich, port-style wine or mixed into your holiday cocktails. Find Rocky Creek at Nat Bailey on December 9. Also look for: the Sparking Finch, a blend of chardonnay and pinot noir from Robin Ridge Winery. 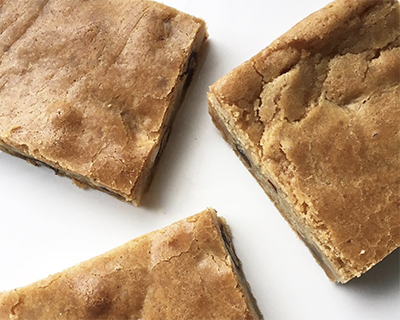 “I don’t like to play favourites, but they make one of the best blondies around,” says Trout Lake Manager Jordan Mehl of Le Bouledogue, one of VFM’s newest bakeries. “I’d definitely lay a plate of them out at your next holiday party.” Along with amazing sweet baked goods, Le Bouledogue also makes a line of specialty jams in flavours like Blueberry Basil. Find Le Bouledogue at Hastings Park on December 10. Also look for: sourdough breads, pastries, and crackers from lakehouse foods. Drunken Chocolatier, who debuted December 3rd at Hastings Park Winter Market, is a top pick this season for Jess Landing, VFM community engagement coordinator. 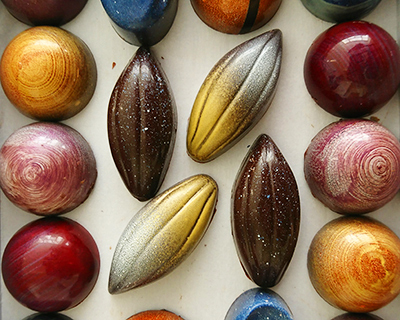 “Their chocolates are incredibly beautiful – they look like paintings, ” says Landing. “Their going to make really great stocking stuffers”. Catch Drunken Chocolatier at Hastings Park on December 10. Also look for: limited edition Mulled Wine Chocolates from Coconama. 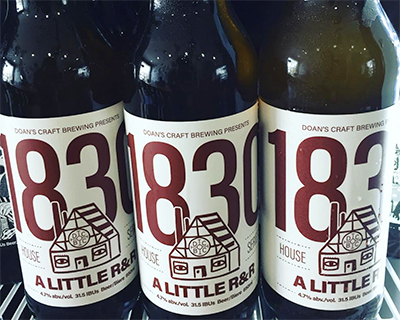 Photo: Doan’s Craft Brewing Co.
Doan’s Craft Brewing Co. is one of VFM’s newest breweries, and we think you should check out their BC grown rye based brews like the Rye Porter and house series Little R & R (with rice and rye). With its distinctive illustrated branding, any of their bottles of cans would look great under your tree with a little red bow. Doan’s will be at Nat Bailey on December 9 and Hastings Park on December 17. Also look for: the Holiday Gift Set from Persephone Brewing Co., containing a beer glass, toque, and two bottles of beer. Find Spruce Goose at Hastings Park on December 10. 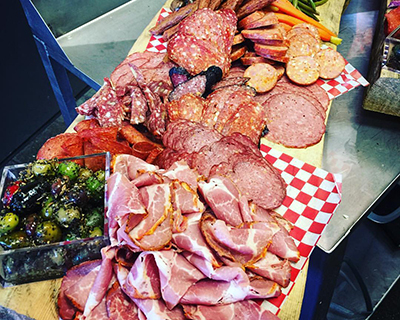 Also look for: some grass-fed beef pepperoni from Greendale Meats. Got a cocktail lover on your list? 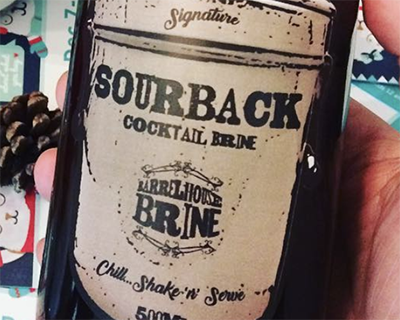 Put a bottle of Barrelhouse’s Sourback Cocktail Brine in their stocking – perfect for sour caesars and pickletinis. Barrelhouse Brine will be at Nat Bailey on December 16. Also look for: Boozewitch Chili Lime Shrub from Gillespie’s Fine Spirits. “Nancy’s designs are classic – her jewellery is the kind of gift you buy for someone else, but end up keeping for yourself.” says Jen Candela, VFM’s Communication Manager, of Nancy Esworthy Designs. 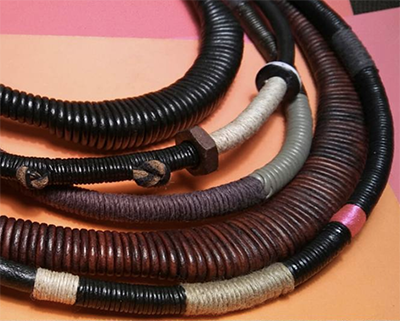 Incorporating unusual materials like deer antler and mammoth ivory mixed with precious metals, wood, and leather, Nancy pieces have a tribal elegance that will please even the most discerning jewellery lover. Find Nancy Esworthy at Nat Bailey on December 9. Also look for: hand forged sterling silver jewellery featuring luminous stones and freshwater pearls from Ildiko Jewelry. “I love the beeswax pyramid candle from von Hardenberg,” says Nat Bailey Manager Randy Elliott. 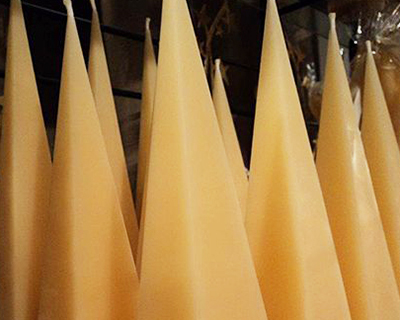 “All of their candles are quality, but that one is such a unique shape for gifting.” Von Hardenberg makes a wide selection of 100% Canadian-sourced beeswax candles, including specialty 5″ tapers that can be used on Christmas trees or for Hanukkah menorahs. Find von Hardenberg Candles at Nat Bailey on December 16. 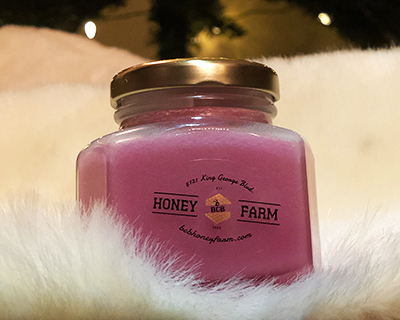 Also look for: Valley Gold Bee Co.‘s selection of candles and tealights made of beeswax from their own hives. The Hive Printing will be at Hasting Park on December 17 and Nat Bailey on December 23. 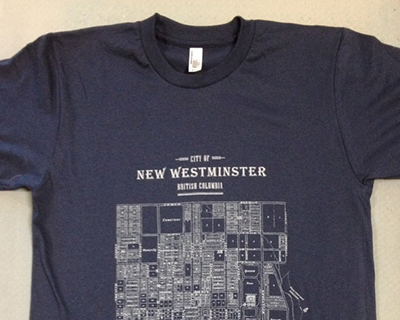 Also look for: Vancouver Farmers Market branded tees, printed on Bella + Canvas unisex jersey t-shirts and available at the Market Info Tent. The dried fruits mixes and fruit leathers from Ambercott Acres are a stocking stuffer must. Made from organic fruit grown on their orchards in Cawston, BC, these sugar free fruit leathers come in 10 different flavours like nectarine-apple and pear-apricot. 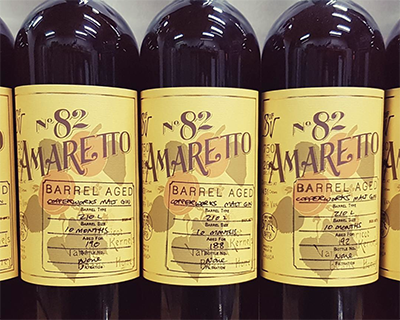 Find Ambercott Acres at Nat Bailey on December 16 & 23. Also look for: Klippers Organics Crispy Apple Chips. Don Asperin creates wood objects that are as beautiful as they are useful. 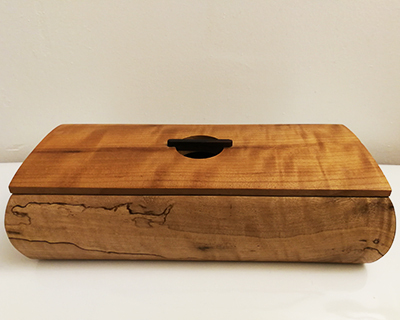 His maple cutting boards, wooden boxes, and small home accents make lasting and practical gifts. Don Asperin Woodworks will be at Nat Bailey on December 9 & 23. 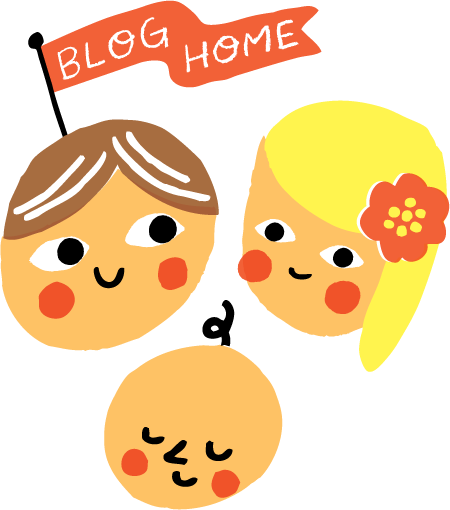 Also look for: screen-printed wood coasters and wall hangings from The Hive Printing. 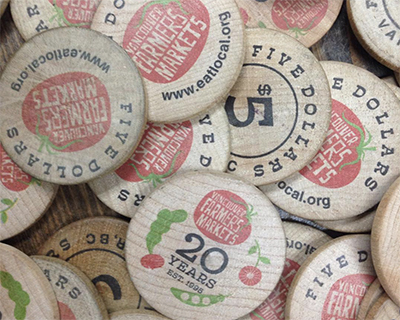 The most versatile gift you could buy for a market lover, VFM Market Money never expires and is accepted at all of our locations. 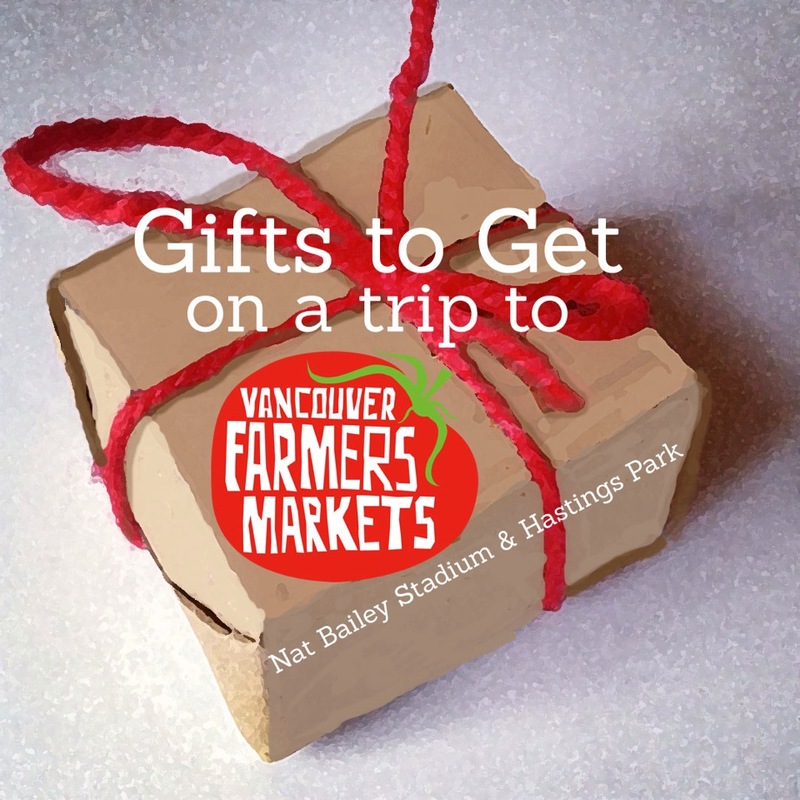 Market Money gift certificates in $20 amounts can be purchased at our weekly Nat Bailey and Hastings Park Winter Markets – bundle one with an annual Market Membership for $40, and we’ll throw in a gift Market Tote Bag. 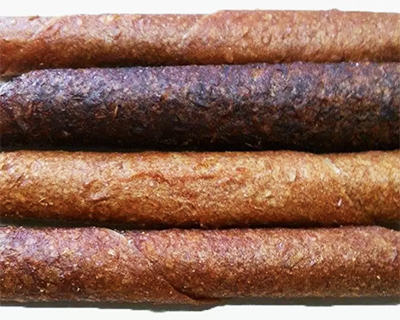 The candied and smoked salmon sticks from Blue Comet Seafoods are a big favourite of VFM Executive Director, Tara McDonald. “They look beautiful on a platter, and nothing says “West Coast Christmas” like smoked salmon,” she says. 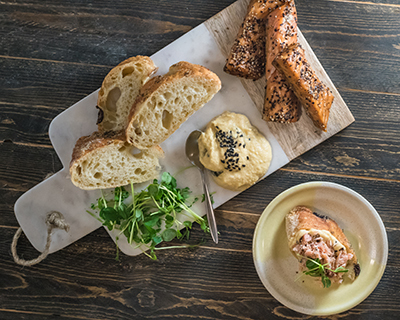 Along with plenty of smoked options, Blue Comet’s canned salmon makes for pretty great stocking stuffers. Find Blue Comet Seafoods at Nat Bailey on December 9, 16, & 23 and Hastings Park on December 10 & 17. Also look for: delicious canned smoked tuna from Estevan Tuna. 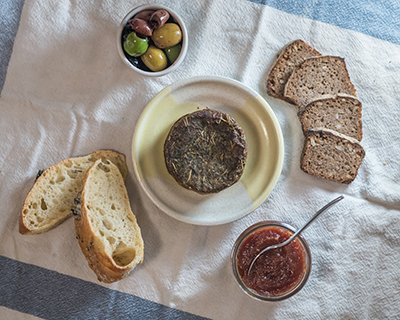 Pâté Pastiche creates vegan and gluten-free pâtés in knock out combinations like golden squash and sage, market herb, and forest mushroom. A great alternative to traditional meat-based spreads, these wholesome pâtés are sure to please vegans and non-vegans alike. Pâté Pastiche will be at Nat Bailey on December 23. 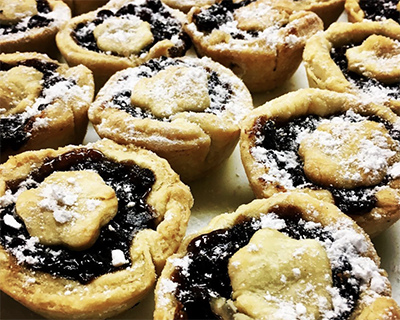 If you’re looking for traditional holiday baking to impress your guests, make sure to check out Blackberry Hill Bakery at Nat Bailey Winter Market this month. They make everything from mince pies to shortbread, Christmas cakes to rum balls – all you have to do is plate it up for your holiday table. Blackberry Hill will be at Nat Bailey on December 9, 16 & 23. Also look for: traditional German stollen from Sweet Thea Cakes. Dundarave Olive Co. brines, marinates, and stuffs their olives by hand. 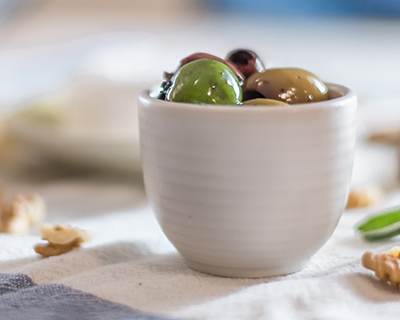 Incorporating ingredients like manchego cheese, dried apricots, and anchovies, their olive mixes are unique and delicious – a must for your holiday party platter. Find Dundarave Olive Co. at Nat Bailey on December 16 & 23. Also look for: classic pickled beets from Anne’s Preserves. 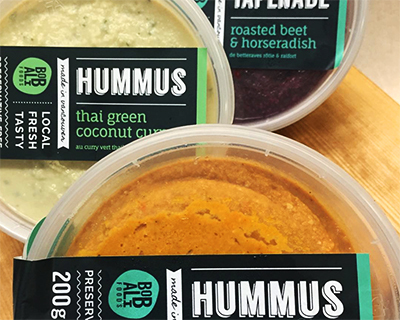 BobAli’s hummus, tapenades, and dips make for a colourful and tasty addition to festive celebrations. Standouts for VFM staff include the Sweet Potato & Chipotle Hummus, and their Beet & Horseradish Tapenade. Find BobAli at Nat Bailey on December 16 and Hastings Park on December 17. Also look for: Tempea vegan tempeh pâté. Lighten up on all those rich, holiday foods with a selection of seasonal fruits and veggies from the Winter Markets. 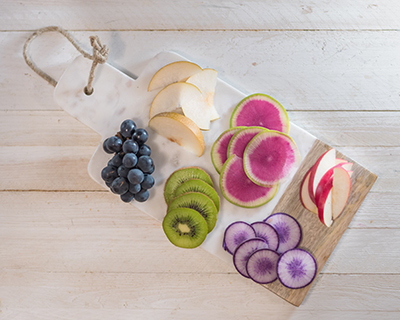 Kiwis are in season, there are still some grapes available, and of course, all of those great storage apples will be around throughout the winter. Check out our In Season page and start planning your holiday grocery lists! Looking for a particular product or vendor? Find them with our Product Search Tool. Nat Bailey: December 9, 16, and 23 Hastings Park: December 10, 17. Join us December 23 for a special holiday addition of Nat Bailey Winter Market, featuring visits with Santa, live carolling, kids crafts, and more! Vancouver Farmers Markets: Bringing local food and local folks together since 1995.